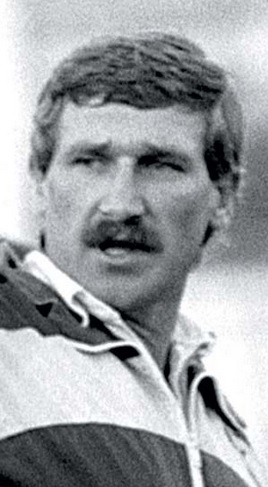 One of the most successful coaches in modern Tasmanian football, Garry Davidson enjoyed great success at club, state and underage levels, including collecting three premierships in six seasons as a coach in the TANFL/TFL in the 1980’s. Born in 1954, Davidson’s football journey began on the north-west coast with Devonport, from where he was recruited by VFL club Geelong as an 18-year old in 1972. After 30 games in four seasons at Kardinia Park, Davidson joined Caulfield in the VFA in 1976. He would play 91 games in five seasons with the Bears, winning two Best and Fairests and VFA representative honours, his time at the club interrupted by a one-year return to the VFL in 1978 with Richmond which produced 10 games. At the end of 1981 Davidson returned to Tasmania to embark on a coaching career, signing with Glenorchy. The Magpies had lost five consecutive Grand Finals from 1976-80, and Davidson’s tenure began in similar fashion, losing a tightly contested 1982 decider to New Norfolk by eight points. The following year Davidson led his charges to another Grand Final and this time the Magpies prevailed, turning the tables on New Norfolk with a 92-point hiding. Unfortunately the joy was short lived, as Glenorchy lost their seventh Grand Final in eight years in 1984, beaten by Clarence after finishing five games clear on top of the ladder. After three years and 54 wins from his 67 games in charge, Davidson resigned as Glenorchy coach after this loss, also announcing his retirement as a player after more than 200 games. After a couple of seasons away from the coach’s box, Davidson was appointed coach of the Tassie Mariners in the Teal Cup for the second time. Davidson had played a key role in the formation of the Tassie Mariners program as the first manager of the Tasmanian Football Development Foundation, and in his second stint as coach he guided the side to modest success at National Under 18’s level. Upon leaving the Mariners in 1995, Davidson spent eight years as a high-profile football manager of Geelong in the AFL, before performing the same role with Belconnen in the ACTAFL/NEAFL and South Fremantle in the WAFL.